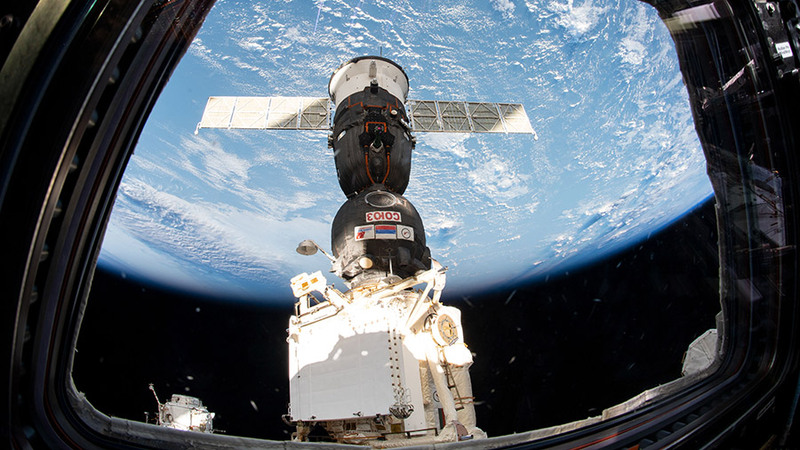 The Soyuz MS-12 spacecraft that launched three new Expedition 59-60 crew members to the International Space Station is pictured docked to the Rassvet module. Cosmonaut Alexey Ovchinin from Roscosmos commanded the Soyuz crew ship flanked by NASA astronauts Nick Hague and Christina Koch during the five-hour, 47-minute trip that began at the Baikonur Cosmodrome in Kazakhstan. NASA astronauts Anne McClain and Nick Hague will exit the space station Friday for a six-hour spacewalk beginning at 8:05 a.m. EDT live on NASA TV. The duo will continue the ongoing work to upgrade the station’s power storage capacity. McClain and Hague will replace older nickel-hydrogen batteries with new lithium-ion batteries and install new adapter plates on the space lab’s Port-4 truss structure. The crew will be readying spacesuits and tools and reviewing spacewalk procedures all week long. This morning, Hague joined Flight Engineers David Saint-Jacques and Christina Koch and sized U.S. spacesuits in the Quest airlock. McClain verified the functionality of the spacesuit SAFER jet packs, also known as Simplified Aid For EVA Rescue. At the end of the day, all six crew members gathered together to coordinate their actions in the unlikely event of an emergency aboard the station. The crew reviewed escape paths to their Soyuz lifeboats and safe havens for access to safety gear and a breathable atmosphere. In the midst of the spacewalk preparations and the safety training, the three new flight engineers are also familiarizing themselves with station systems. Cosmonaut Alexey Ovchinin is beginning his second mission aboard the orbital lab since March 2016. Hague and Koch, both members of NASA’s 2013 class of astronauts, are each on their first mission aboard the space station. NASA: Thank you for outstanding service and support for our space exploration! And creating opportunities for international cooperation with other countries is a blessing. Let there be peace on earth!